If an apple a day keeps the doctor away, what would it take to avoid a heart surgeon? How about a multivitamin / mineral pill and some omega-3 oil (canola-rapeseed, flax, fish)? Add a diet low in processed food and a good 'lifestyle' (don't smoke, control waist size, manage stress well, some exercise) and you will improve general health and help prevent heart disease. It is normal to believe you're eating a good diet but even the best diet does not get you the vitamin levels that our bodies and genome developed on. Supplementation fixes this and is safe, cheap and easy. In food processing, as when making flour or noodles, we lose 60-90% of most heart healthy vitamins. We degrade proteins by frying and high heat and our factories hydrogenate oil which first zaps all omega-3 (really vitamin F-3) by trans-forming it into toxic trans fat. Science shows that a heart healthy diet is one with relatively unprocessed foods with veggies and some fruits, and rice or grains that retain some of their original kernel-structure to slow digestion. Such 'whole' foods became scarce in Western diets. If you can't recognize part of the original food, the item is processed or refined. Some eggs, liver or fish are probably also vital for most of us. Why a add multi-vitamin pill to your diet? Well, most fast single nutrient diseases like scurvy, beriberi and goiter were wiped out by food fortification, our 'weapon of mass nutrition'. However, processed foods low in many nutrients such as vitamins B6, B12, folic acid and others, cause 'Long-Latency Deficiency Diseases', such as heart disease, cancer, bone loss and Alzheimer's. Think of these as nutrient deficiency diseases with long incubation periods and the science suddenly makes sense! Start with cholesterol and the science will never makes sense (can your doctor explain the 6th figure from the bottom?). Most scientists agree that almost no one has optimum levels of many key nutrients and that a multivitamin + mineral supplement fills many such gaps. Bonus: a high dose multi is the only therapy to lower homocysteine, a slow poison simply corroding our life-long structural proteins, linked to over 100 diseases. A bottle with 6 months no-iron multis has no child-proof cap, it's that safe! The evidence for benefit is massive and pennies per day. The bad news: common oils with over 50% of the omega-6 poly-unsaturate linoleic may be harmful (soy, corn, sun and safflower, grape and cottonseed) as is all hydrogenated [trans] oil ('vegetable' shortening, deep fry oils or ghee, donuts and 90% of margarines). **) Soy oil is a double edged sword as per person use in the U.S. went from zero 65 years ago to 31g/day, 10% of average daily calories. Soy is the main source of excessive trans and omega-6 fats but it DOES provide credible omega-3. It is hidden and everywhere (scientific poster: or ). These simple basics should prevent or postpone nearly 80% of heart and other serious diseases! What could be easier than an oil change to canola or flax (linseed), away from corn, sunflower or unidentified oils, and a few supplements at the end of your largest meal. Easing off on the highly refined carbs, the next step, is not that easy --as, each year, the average American eats his weight in added sugars, 650 Calories per day. Apart from lowered nutrients, grains ground into a dust (flour and most breakfast cereals) or starchy potatoes (low-fiber, rapidly absorbed carbs) keep you hungry and stress your insulin system, promoting overweight & adult diabetes. Here, high insulin plus high blood sugar team up to reduce blood circulation and promote heart disease. All illness has nutritional links. There's no doubt that all omega-3 oils (nature's COX inhibitors) lower heart attacks and double your survival chances while Vioxx and Bextra raise risk, as may Aleve/naproxen & Celebrex. Omega-3's from fish have anti-inflammation effects and help arthritis and bowel disease. Why not consider if such condition can be linked to a low intakes of such oils. This site will help you think along those lines. A good multi is a zero calorie Essential Food Group, Ounce Of Prevention and Nutritional Seat-Belt. There is no research showing that avoiding vitamins makes you healthier and it's the only easy life-style change you can make. This website may not make you smoke less, walk more or revolutionize your diet but these ideas are simple and benefits major. This website takes you from the not-so-bad cholesterol via fats and vitamins to the tastier foods; it is a free 86 page book in PDF [needs free Acrobat] without the 'cholesterol page' PDF. Home page only. The next page has the essentials but do visit the last page. This site is for your well being so input is appreciated. CHOLESTEROL you asked? Likely a protective factor, not a risk factor prior to refined foods while the famed Framingham study found clearer thinking with higher cholesterol and decreasing levels after age 50 predicting more heart disease deaths! Cholesterol Pills, statins like Lipitor, Zocor, Pravachol, Lescol, Mevacor or Crestor, (killer) fibrates and niacin (mega vitamin B3) have side effects, good, bad and unknown. Studies show that lowering cholesterol with statin, fibrates or omega-6 oils (but not niacin or fiber) promotes cancer [general effects and seniors]. The more statins cut cholesterol, the more they cut energy to nerves, muscle and heart by lowering CoQ10, 'battery acid' and anti-oxidant ('catalytic converter') of every cell. Here's a study with best cholesterol in the old 'normal' range of 180-240 (4.6-6.0) -also: 1, 2 and the 3rd to last picture on this page. More: thincs.org and Cholesterol Myths. The U.S. "powers that be" in 2015: "cholesterol is no longer a nutrient of concern." ..
Drug and food interests create cholesterol fear but statins don't work by lowering it and don't save women: BMJ Feb., JAMA May, JACC Sept. 2004, CMAJ Nov. 2005. More cancer and no survival benefit (±0.1%) in high risk older Europeans: Lancet 2002 (3 million $3 pills taken). Next, in 6 years, nobody saved (±0.07%) in this younger group of 5170 Americans. PS-1 In heart failure: lowest 20% for cholesterol: double the death rate! PS-2 Lipitor's TNT trial implodes: 5000 heart patients for 5 years on 80 mg top-dose suffer 2 more deaths than patients on only 10 mg. On either dose, the same 26 ±1% progression in artery calcium in 12 months anyhow! Lipitor does NOT save lives in studies. PS-3 Out of 1/2 million U.S. men at 'prime heart attack age', the top for cholesterol [292 mg/dL (7.5 mM)] on anti-cholesterol absorbing drug for 7.4 years (and 1/8th less 'bad LDL' compared with dummy drug) but no difference in survivors; count them: 3. And, oeps: in 65,000 men with 2700 deaths, those with least cholesterol [below 187 (4.8)] had most deaths! PS-4 The American College of Cardiology in 2004: "... there is no evidence for a total mortality benefit in women from dyslipidemia [statin] treatment." Women: 3 more deaths on Zocor and 2 more heart 'events' on Lipitor in large studies (4S, ASCOT). In 24,000 women over age 50, those in the lowest third for cholesterol had the same risk for death (+60%) as those smoking! Fever indicates infection but sitting in ice water won't kill the microbe! 'Cholesterol', insulin, sugar and blood pressure are also indicators, think: excess junk carbs, lack of micro-nutrients and artery decline in progress. Above minimal '6' homocysteine is the indicator for your personal lack of most B vitamins. But unlike cholesterol, homocysteine corrodes (permanently damages) all proteins. 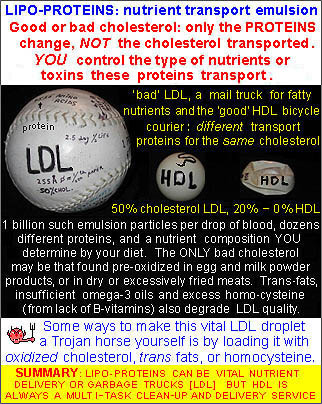 It is also a poison pill in cholesterol transporters (LDL droplets), making 'cholesterol' actually become 'bad' -as do trans fat and oxidized cholesterol from foods with egg or milk powder. Homocysteine above 6 µmol/L [a 'modern' diet and not taking a multi] is the main reason for heart disease and also for it running in families. Multi-vitamins slash homocysteine, keep arteries open and thin and flexible and help avoid heart surgeons. A BMJ study: '..there is still only .. inconclusive [sic] evidence of the effects of modification of total, saturated, mono-unsaturated, or poly-unsaturated fats on cardiovascular [disease and] mortality.' Here's a 2006 JAMA disease summary: the futility of eating 'less fat'. Incidentally, hydrogenation of oils, most industrially refined foods and heart attacks are something of the last 95 years [text for graph]. We explore heart disease as a recent multi nutrient deficiency problem, starting with omega-3 oils, magnesium, folic acid and vitamins B6 and B12. There are no drug deficiency diseases, or 'essential diets', only essential nutrients, yet, per capita, Americans use $70 prescription drugs per month. Most drugs manage lab-numbers or symptoms like pain, not root causes; they don't 'cure'. This is why cholesterol, sugar and blood pressure drugs have such difficulty proving they save lives. Fat plus cholesterol, 'atheroma', in arteries does not happen in wild animals, only in humans, a rare species not making its vitamin C and the only one using cooking, refining and food processing, decimating the nutrients that tame toxic homocysteine. Atheroma is largely a repair gone bad. This site suggests to prevent the injury and control the repair with the 'homocysteine vitamins', omega-3 oils and other nutrients. Many arteries blocked like Bill Clinton: one-year deaths on drugs 1.5% but slightly less drugs with by-pass or angioplasty 4.2%. Medicine-related deaths in the U.S. may be the 3rd leading cause while nutrients are safe, and cheap. This age old concept is called nutritional, naturopathic or orthomolecular medicine, the human equivalent of fertilizer and healthy soil for plants. Copyright waived. Founded in 1998 by Eddie Vos, M. Eng., Glen Sutton (Qc) Canada. While based on current science, this site has no final answers or gives medical advice: it helps you think more clearly about nutrition, health and the prevention issue. Changed on November 13, 2017. Full site PDF excluding the 'cholesterol' PDF; home page only. ways of slowly degrading and 'unraveling' this fiber reinforced elastomer architecture. Not good.